Although Corey Haim was found dead today at 38 in what appears to be an accidental drug overdose, many in the Snooze Button Generation may not be shocked. Haim had been in terrible "check yourself before you wreck yourself" shape for years. He is another reminder that child stars often live painful, tragic lives. 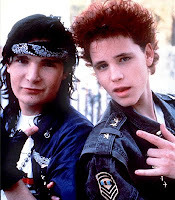 But, hey, let's remember Corey Haim for his teen work. 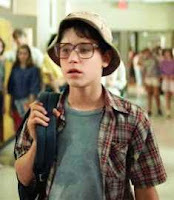 I like "Lucas" the best of his roles, but "The Lost Boys" is his most popular film. I don't think Haim ever played an innocent teen after "Lucas." Then, he played heartthrob teens - and that's probably messed up. A few others of Haim's films are relatively well-known, such as "License to Drive," "Dream a Little Dream" and "Murphy's Romance." Between 1982 and '98, he was in a whopping 32 films. Man, that's a whole lot of obscure stuff. Less than two years ago, Haim and the other Corey, Corey Feldman - who I once met at a Long Beach Grand Prix and yukked it up with - said in a reputable story that they were sexually abused as children. Around that time, Feldman appeared to be getting healthy. Haim, on the other hand, was not and looked horrible on the duo's reality show "The Two Coreys." Perhaps Lucas died far earlier than today. Man, I can't imagine being a child star. It must stink when you did the thing the Snooze Button Generation will remember you for when you were 14. Then, innocence is lost, and before you know it, so is your life. Dream a little dream, Corey. Dream a little dream.